Branding enhances shareholder value, it can become a catalyst for better leadership, it enables to drive a shared vision throughout the organization, and it can help to balance short- and long-term perspectives and performance. Many Asian companies traditionally focused on asset-intensive industries. But it has been demonstrated by McKinsey & Company that the most profitable Asian companies focus on intangibles such as human capital, exploiting network effects, and creating synergies based on brands or reputation, rather than investing in tangible assets. 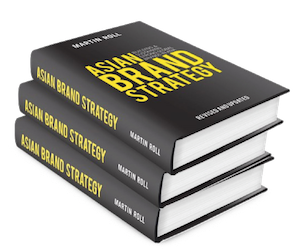 For Asian companies to become successful, branding can no longer be delegated to the mid-level marketing function. Instead, the Asian boardrooms and the CEO must take charge of the brand strategy, lead the brand development, manage its implementation and be fully involved in performance tracking and benchmarking. Branding should be represented at the boardroom level and be equally represented along with all other company functions. Singapore Airlines is one of the best examples of this – they are brilliant in balancing well these issues. Samsung is another example of a company which moved from a pure diversified manufacturer towards a company with strong cash flows from branding. Coca-Cola, P&G and Gillette (now owned by P&G), Starbucks, L’Oreal and LVMH are other global brands which are very well-managed and which provide solid cash flows from brands and portfolio of brands. Branding as discipline has evolved over the last couple of decades from being just an addendum to advertising campaigns, fancy ideas of the marketing department, optional function of the elite few to finally being recognized as a boardroom discipline that not only contributes to the top and bottom line of the company but also aids in enhancing shareholder value contributing to the market capitalization of the company. For branding to play a pivotal role in the company, it has to have a strong support from the CEO and corporate management. Only when the corporate strategy is aligned with the branding strategies will the company attain a unified direction both internally and externally. Companies must ensure that everyone in the company is properly aligned with the brand values with the right mindset and belief. The entire company and its multiple and cross-functional actions and activities should be channelled towards this goal. The CEO and the entire executive management team are very important stakeholders to make this happen successfully. Internally, this comprehensive task of aligning and managing customer touch points cannot be left to or even controlled successfully by marketing departments alone. The boardroom should take a more active role in the cross-functional orientation of marketing in the Asian organization. For branding to realize its full potential in any company, employees across functions must be educated about the significance of branding and how branding affects each function in any company. Such a cross-functional training would not only allow employees to understand the strategic contribution of their own part of the work but would also facilitate a better participation in various activities. Most importantly such training would allow all employees to realize the huge impact branding makes on every aspect of the business. This realization is crucial for internal branding – a process by which a brand is brought to life within the company. Externally, the Asian business leaders can benefit tremendously by representing and leading their brands by example. Asian business leaders can help to build their brand portfolios by appearing more outside the boardroom, and acting as the primary spokesperson of the brand strategy and vision, internally and externally. In fact, it will require a shift in focus and priority for every functional aspect of the organization aligned around multiple customer touch points. When the CEO and the corporate management team actively involve themselves in and nurture branding, the above roles of branding can be effectively utilized. A strong brand with a unique identity and personality would help define the culture of a company. It facilitates companies to either be customer centric or product centric and thereby shapes the internal and external relations of the company with its many stakeholders. But for a brand to perform this role, the presence and back up of a strong leadership is quintessential. By being a strong brand evangelist, a CEO can define and defend the actions of a brand. An effective measure of value is brand equity, and many studies provide strong evidence that brand equity greatly impacts brand valuation and hence the market valuation of companies. There are several stakeholders concerned with brand equity, such as the firm, the customer, the distribution channels, media and other stakeholders like the financial markets and analysts, depending on the type of company ownership. But ultimately it is the customer who is the most critical component in defining brand equity as it is his/her choices that determine the success or failure of the company and the brand. The late management professor Peter Drucker said that the only two functions of any organization are innovation and marketing. Irrespective how innovative a company is, how committed the employees are, and competent the top management is, unless the company connects with the customer, success will be elusive. The top management should constantly evaluate their strategic decision in the context of customer feedback – what do the customers’ value and how can the customers help the company in co-creating value. Customer knowledge about the brand, the perceived differences and its effects on purchase behavior and decisions lies at the heart of brand equity. The knowledge and associations attached to the brand result in choices which have a direct impact on the brand’s financial performance and shareholder value. Brand value is driven by margins that the brand is able to charge and the customer loyalty. These two issues have to be benchmarked against competitors and provide differential advantages. However, if brands are well-known hence being valued very highly, they are also part of the public space and gets lots of attraction. The reasons for buying brands are that we have an emotional bond to them due to their ability to connect us to communities. Psychological research demonstrates that brands are durable because people are cognitive misers. The modern society is overloaded with information, and the average person receives far more information than one can possibly digest properly. Therefore, people seek to simplify the world by relying on a variety of heuristics to minimize the amount of searching and information processing needed to make reasonable decisions. Once people believe a brand works for a certain purpose or reason, they are less likely to seek out new information that challenges the assumptions. Sociological research also demonstrates why people are less likely to switch brands. Multiple elements like images, stories and associations are attached to a brand. As these elements are shared collectively by groups and networks of people, they form generally accepted conventions about brands. It is therefore relatively difficult for individuals to switch brands and thereby abandon these shared conventions. It is very much the case for brands in the luxury and fashion sector, but also brands that trade in lifestyle, personal health and others are in this category. It somehow applies for brands we are less connected to in general, say business-to-business brands. It is well-known that people would choose well-known brands in these sectors as well – partly because of some rational decision criteria, partly because of emotional criteria. Asian companies can have great intensions and aspirations to move up the value-chain through branding to capture the financial and competitive benefits, but to achieve these objectives successfully, Asian companies must follow a comprehensive brand strategy framework supported by a systematic process throughout the organization. Successful implementation of these processes will help Asian boardrooms in achieving sustainable revenue and cash flow streams for the future. Asian cultures have always valued the long-term aspects in almost any aspect of life. Asian boardrooms should use this unique strength to influence them in creating more successful brands – but it requires a different mindset in the Asian boardroom.